HONOLULU — The Coast Guard is searching for a possible missing diver approximately five miles south of the Molokai airport, Wednesday. Watchstanders at Coast Guard Sector Honolulu received notification from the tug American Contender, who reported an orange dive flag and buoy with a taut line approximately five miles offshore. The American Contender monitored the area and no one appeared to be in distress in the immediate area. An MH-65 Dolphin helicopter crew from Coast Guard Air Station Barbers Point was launched to the scene to search for anyone in distress. 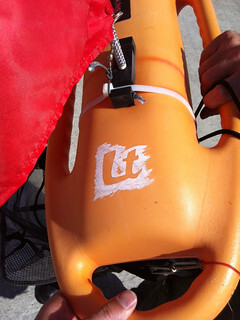 The MH-65 helicopter crew recovered the dive buoy and discovered it was marked with a few stickers and the initials ‘Lt’ handwritten with a white paint pen. A bag of seashells was also attached to the dive buoy. The Coast Guard advises the public to label all watercraft and equipment with contact information in order to quickly account for owners and prevent any unnecessary searches. Through the Operation Paddle Smart program, the Coast Guard offers a free “If Found” decal to be placed in a visible location on watercraft. The information on the sticker can allow response entities to quickly identify the vessel’s owner and aid in search and rescue planners in determining the best course of action. The Coast Guard is asking mariners to keep a sharp eye out for anyone possibly in distress. Anyone with information that may help identify the owner of the dive float is asked to contact the Sector Honolulu Command Center at (808) 842-2600.